The science is clear but Victoria’s Minister for Environment chooses to ignore it or she would rather see dogs in a National Park than native animals. 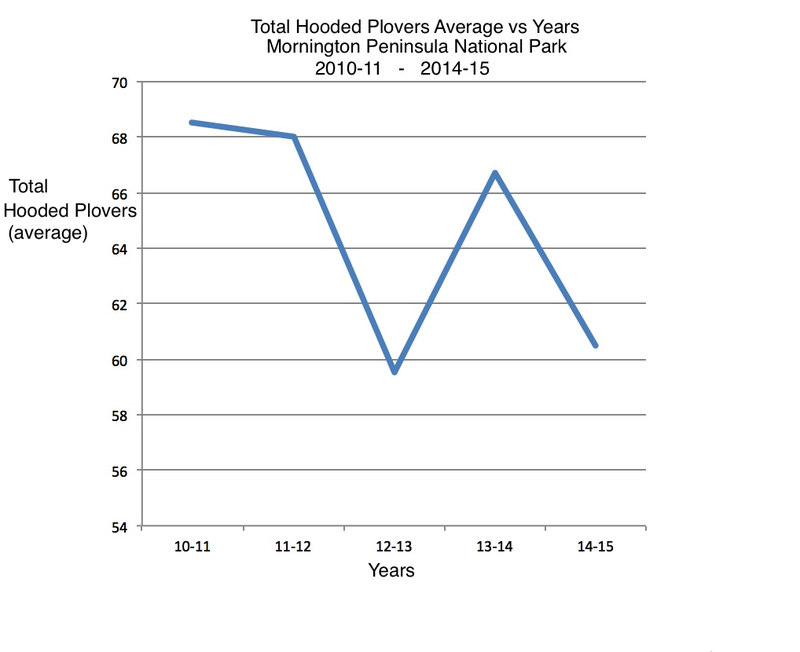 The total population of Hooded Plovers in the Mornington Peninsula National Park is in decline. Breeding results recorded over each season in the Mornington Peninsula National Park over recent years demonstrates the population is not sustainable. Dog walkers ignore regulations and deliberately put the National Park’s Hooded Plover population at risk of local extinction. Volunteers have been counting Hooded Plovers in the Mornington Peninsula National Park on a regular basis for 20 years or more. However, in recent years, unpaid volunteers have been solely responsible for collecting and interrogating the data. The results of surveys carried out four times per year over the last four years has been averaged and displayed (Figure 1). Clearly, the population is in decline. Each Hooded Plover breeding season in the Mornington Peninsula National Park, volunteers, Parks Victoria and BirdLife Australia staff closely monitor nesting, egg laying, hatching of eggs and fledging of chicks in the National Park. In the last five years, the average rate of failure for each egg laid has been calculated as 96% (see Figure 2). 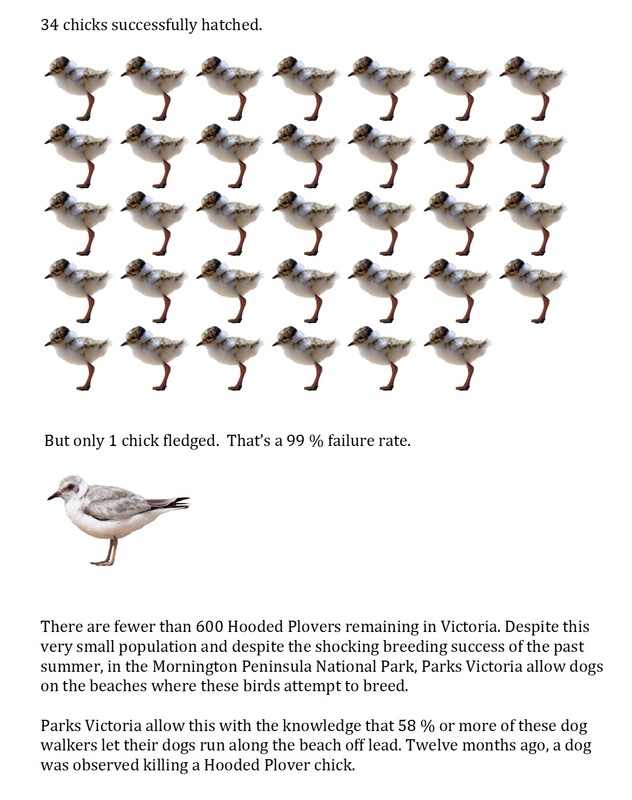 Clearly this rate of failure to reproduce for a population of threatened shorebird is not sustainable and explains why the National Park’s Hooded Plover population is in decline. Volunteers, Parks Victoria and BirdLife Australia staff also monitor and record the number of dogs seen on Hooded Plover breeding beaches in the Mornington Peninsula National Park and whether or not the dogs observed are on a leash. Results from 305 observations in the summer of 2014/15 clearly identify that 75% of dogs run free on Hooded Plover Breeding beaches in the Mornington Peninsula National Park, (BirdLife Australia 2015). One may ask, is a dog off its leash a risk to Hooded Plovers? Volunteers once again provide the answer. In December 2012 two members of the public monitoring a Hooded Plover chick at Point King on the Mornington Peninsula, directly observed a Labrador kill a thirty five day old Hooded Plover chick. The dog was not on a leash. Despite this clear evidence of a dog killing a Hooded Plover chick and the compilation of science collected by the public, BirdLife Australia and Parks Victoria staff, The Minister refuses to ban dogs in the Mornington Peninsula National Park, see The Age 21 March 2015. Ornithologists, ecologists, zoologists, volunteers, a forum put together by Parks Victoria, the Victorian National Parks Association, BirdLife Australia, the Friends of the Hooded Plover and the majority of Parks Victoria staff and the Department of Environment Land Water and Planning to mention a few. The Minister is risking the survival of Hooded Plovers and appears she would rather a continued unsustainable breeding outcome for Hooded Plover in the Mornington Peninsula National Park in favour of upsetting dog walkers. The same dog walkers who mostly ignore park regulations and walk their dogs off leash in a Victorian National Park. The same dog walkers of whom two have assaulted a volunteer. The Minister is also out of step with the local MLA for Nepean, Martin Dixon who has addressed Parliament and suggested dogs should be banned from the Mornington Peninsula National Park. The Greens have also suggested, “off the record” that they will support a total ban of dogs but have yet to say so publicly. My thoughts are, if you live in Melbourne and want to see a Hooded Plover before they become locally extinct in the Mornington Peninsula National Park, you had better get down to the National Park quickly. There are fewer than 600 Hooded Plovers left in Victoria and only 60 in the National Park. and ask him to ban dogs in this National Park. 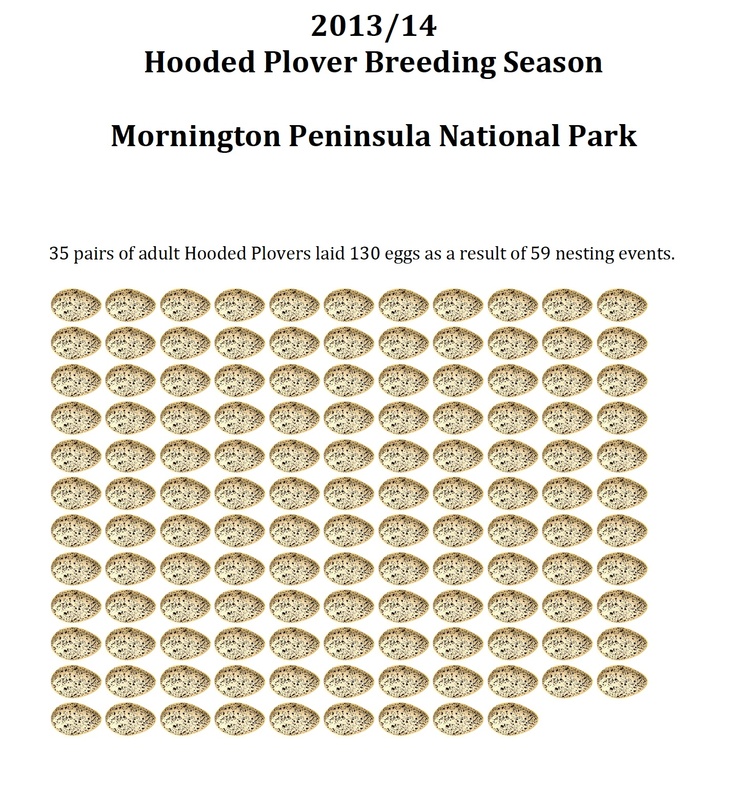 The Hooded Plover breeding season on the Mornington Peninsula has been underway since mid October 2013. It is expected to continue for another four months, (March 2014). Unfortunately, so far this season, nine (9) Hooded Plover chicks have died in the Mornington Peninsula National Park. This breeding season, on the Mornington Peninsula, no Hooded Plover chicks have fledged. Most of the nine chicks have died within the first week of their life. Sadly this is expected on the Mornington Peninsula. 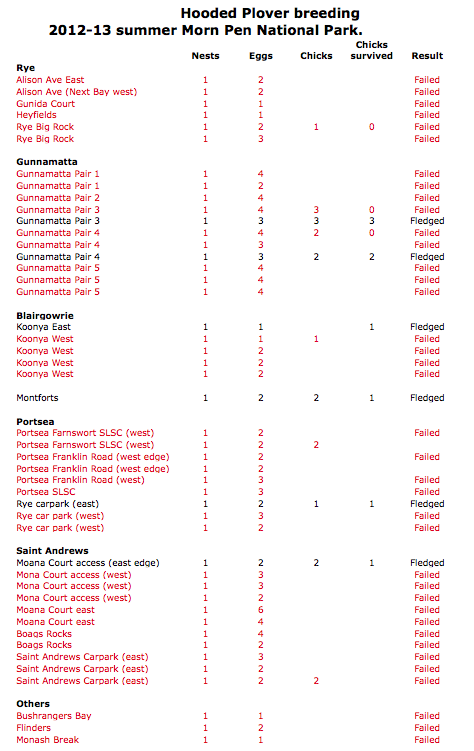 For a number of years, over 90 % of breeding attempts in the Mornington Peninsula National Park have failed. During the 2011/2012 breeding season, there were around 137 eggs laid with only three chicks surviving. That’s a failure rate of 98% ! However, these figures are now being questioned by members of the public and more importantly, by volunteers monitoring Hooded Plovers on the Mornington Peninsula. A new online database being used by dozens of volunteers, is suggesting the results are worse than has been stated in the past. Previously, those people interested in monitoring Hooded Plovers, were in the most part reliant on Parks Victoria to provide the results but a new on line data base, known as the MyHoodie Data Portal, indicates the Hooded Plover breeding failure rate could be much worse. The MyHoodie Data Portal was put together by BirdLife Australia and allows registered volunteers to record what is happening on beaches all over South Eastern Australia, including the Mornington Peninsula. At least two, recently hatched Hooded Plover chicks, have disappeared from a beach at Rye in the Mornington Peninsula National Park. They are most likely dead. Parks Victoria allow dogs on this beach and most people walk their dogs off lead. The chicks have been missing for around a week. There are fewer than 600 Hooded Plovers left in Victoria. The survival of this threatened species in this National Park is a indicator of the effectiveness of Parks Victoria in managing our states natural resources. It’s been a while since the end of the Hooded Plover breeding season and there has been no official feedback from Parks Victoria or analysis of the results. That’s not surprising. 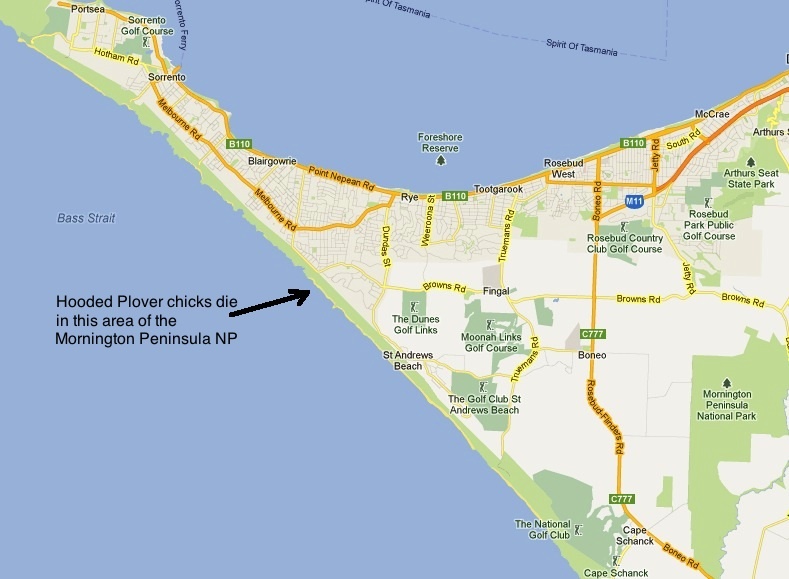 The last HP breeding season on the Mornington Peninsula was significant due to the very unfortunate but direct observation of a dog killing a Hooded Plover chick at Point King (not a PV managed beach). We now have direct evidence to demonstrate that “dogs kill Hooded Plover chicks”.